Production of Iran's most popular car, which was modelled on the 1960s Hillman Hunter, has come to an end after nearly forty years. The Paykan, which is driven by about 40% of Iranians, has been discontinued because it is a heavy polluter. First built in 1967, the car is highly valued because of its low cost, its durability and easiness to repair. However, it has gone out of fashion with younger drivers who prefer to be seen in more contemporary models. 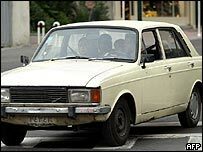 The Paykan - meaning 'arrow' in Farsi - is still profitable and manufacturer Iran Khodro was reluctant to halt production. Paykan shouldered Iran's auto industry for years. However, the Iranian government - which controls Khodro - has insisted that the car be gradually removed from the country's roads because it is considered an environmental hazard. Burning fuel at 12 miles to the gallon, the car does not meet international emissions standards and its forty year old design precludes any radical technological alterations. 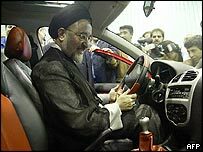 "Paykan shouldered Iran's auto industry for years," industry minister Eshagh Jahangiri said on Sunday. "But we could not continue our support of domestic products at any cost. I congratulate Iran Khodro company for its brave decision in stopping the Paykan assembly line with the intention of advancing Iran's automotive industry." The Paykan was born after the Iranian company bought a Hillman Hunter production line in 1966 and it went on to outlive its UK prototype by twenty five years. The Hillman Hunter model was discontinued by the UK arm of Chrysler in 1979 and exclusive manufacturing rights were sold to Iran Khodro. Despite lacking a host of modern requirements such as air conditioning and ABS braking systems, the car has retained widespread popularity, particularly among lower income groups. The car costs $6,000 (£3,260), compared to its intended replacement - the British designed Samand - which costs more than $11,000. It is particularly popular with Iran's many part-time taxi drivers, who use the car as a second source of income. Foreign manufacturers - allowed to operate in Iran through joint ventures with Iranian firms - may be less sorry to see the Paykan go. Car sales have risen by more than 30% every year since 2000 and the Paykan's gradual disappearance should create more room for foreign models.